Kimchi, or spicy fermented cabbage, is the national food of South Korea and a small dish appears alongside pretty much every meal served in the country, even breakfast! 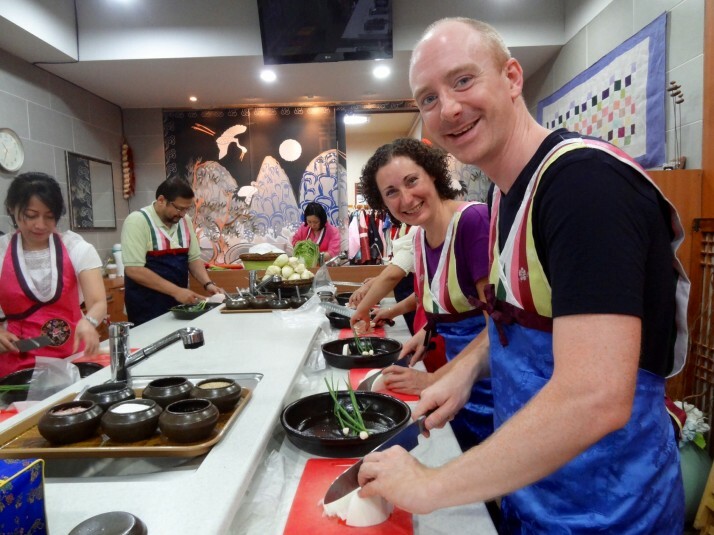 I’m pretty sure that there are as many variations on the recipe as there are Korean grandmas but the class we took at the Seoul Kimchi Academy House hopefully gives us a good base to work from. For me, the class was a little fast paced as we barely had time to finish one step before the instructor was talking us through the next one, but the ladies running it were friendly and it was a fun experience. 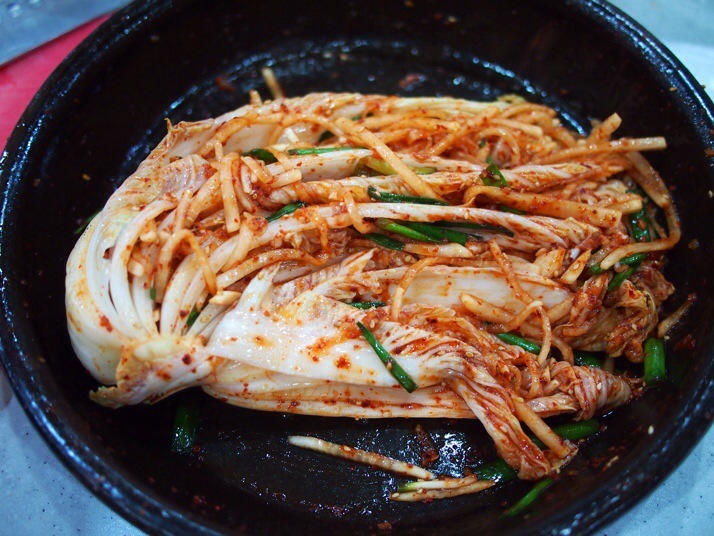 Kimchi is usually made from Napa cabbage, also called Chinese cabbage. Depending on their size, the cabbages should be halved or quartered lengthwise so that the leaves are still attached to the core and then salt should be rubbed between each layer of leaves before setting the cabbages aside, covered with water, in a bowl or bucket for around 7 hours in the summer, or up to one day in the winter. Once they’ve given up some of their liquid and the leaves are limp, they need to be rinsed thoroughly three times in fresh water before being gently squeezed to get rid of any excess liquid. Obviously we didn’t have enough time in the class to do step 1 so we skipped ahead to the second step, preparing the rest of the vegetables. To make 1kg kimchi you will need one quarter large Napa cabbage, a good sized chunk of daikon radish, 3 spring onions, and 2 of what I think were garlic chives. Mix everything thoroughly with your hands making sure to wear gloves (especially if you use contact lenses!). Add the cabbage quarter to the bowl and work the radish and spice paste between the leaves taking care to make sure all the surfaces are well coated. 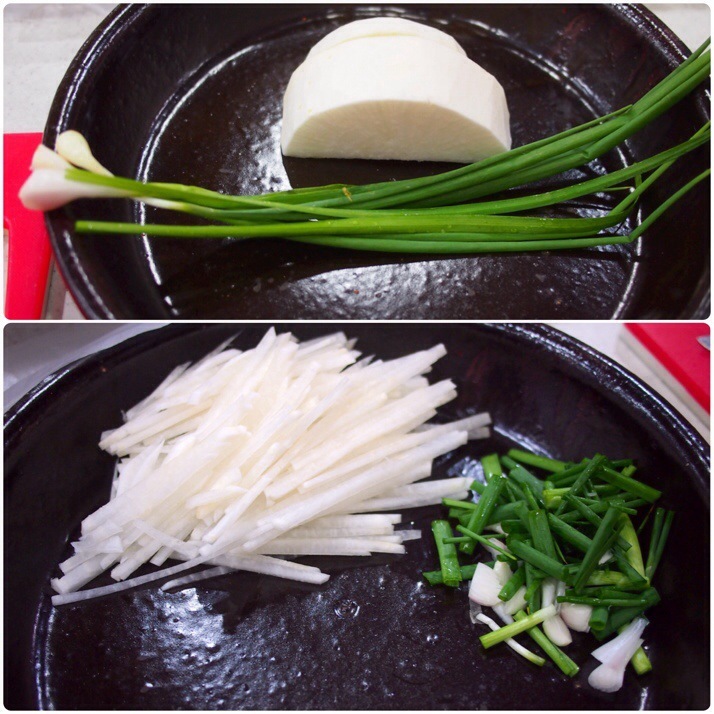 To store the kimchi, our instructor showed us how to take the cabbage quarter in our palm with the two outer leaves hanging down, twist them under and around to make a tight bundle, and stuff any loose radish pieces into the hole that this creates. Put your kimchi into a suitable container and leave to ferment for at least a week. 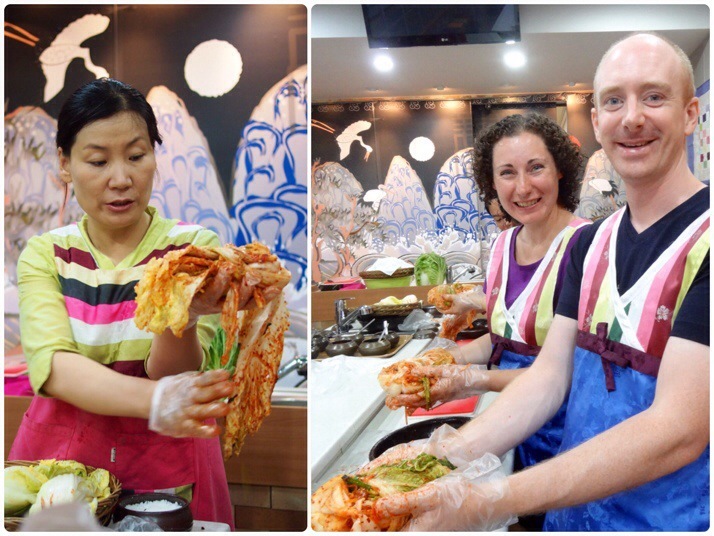 Some Koreans like their kimchi really sour and might keep it for up to one year before using! 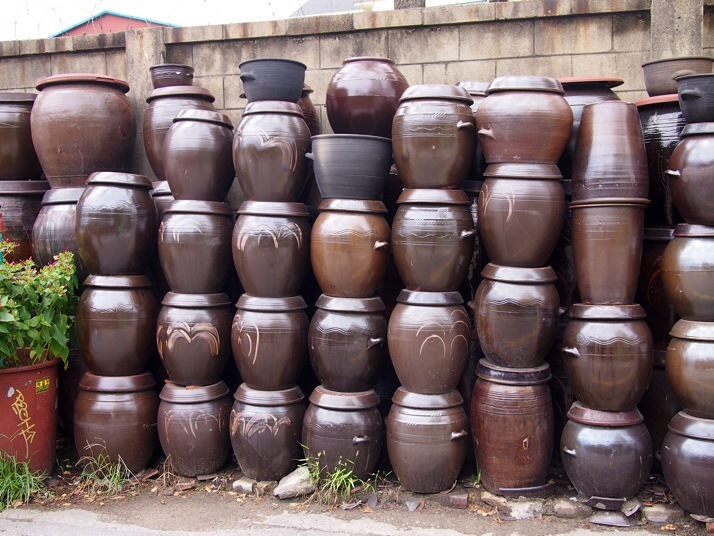 You can also use it as an ingredient to make kimchi soups and stews or even pancakes. 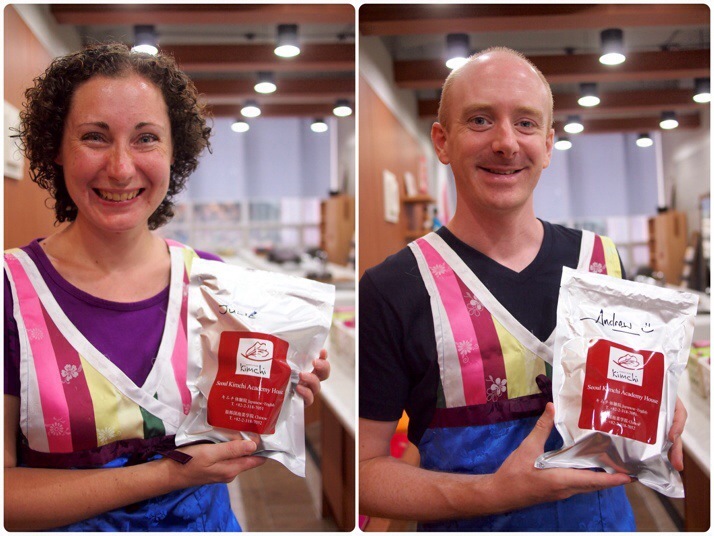 We’re looking forward to opening the packets up for a taste test soon! 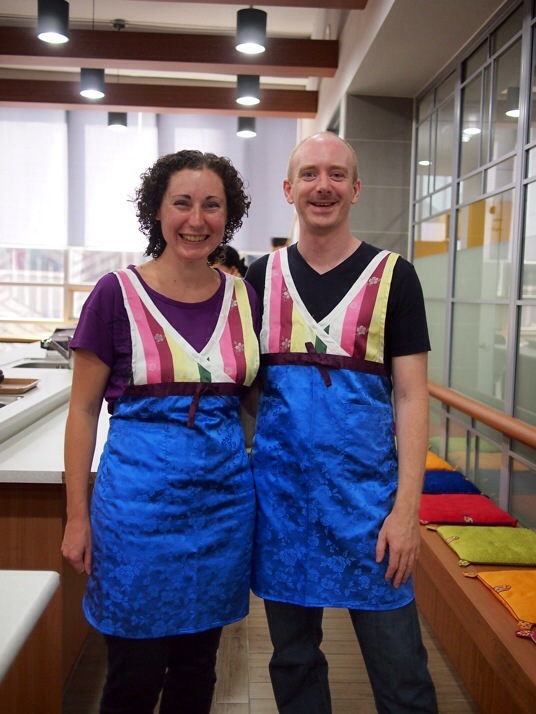 This entry was posted in Experiences and tagged Food, Kimchi, South Korea on August 6, 2014 by Julie. 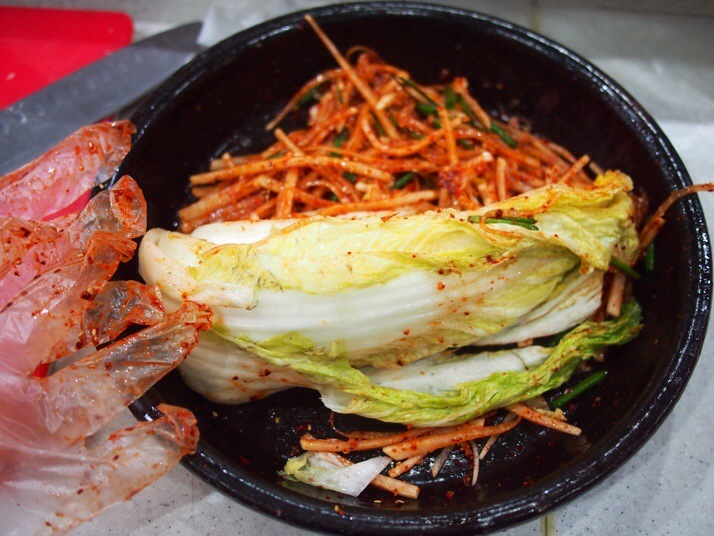 Still not entirely convinced by this idea – the addition of the shrimp seems odd – but hope you enjoy your own kimchi! Presumably there wasn’t any issue getting it into China? After nearly a month eating kimchi every day I was surprised by the addition of shrimp, it doesn’t taste fishy at all. I think it probably has the same role as all the fish sauce in Vietnamese and Thai cuisine – just adding a salty savouriness. We packed the sealed packets in our checked bags and there was no problem on the flight at all. Whilst your ability to keep up with the course instructor is very impressive, I was also struck by how fetching you both were in your pinnies! Hope the pack contents didn’t disappoint when you opened them.. Thanks for the compliment – I think! I’m going to keep lobbying for a great homecoming feast featuring food from your travels. I’ll even help out – still planning on trying to make pho bo at some point! Mmmm pho :). I’m completely up for that. Maybe you’ll be able to add plov to your repertoire in a few weeks as well!